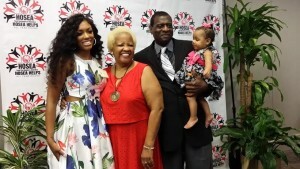 (APN) ATLANTA — This year’s first annual Hosea Feed the Hungry media brunch announced the official launch of Hosea Helps (HH). Hosea Helps works 365 days a year to help an additional 3,500 people with new programs and expansion of other programs to better serve the community every day. Today a new generation of Williams’s are carrying on the family tradition of helping others that was started by Hosea Williams. HSTH is led by Elizabeth Omilami, CEO, and the daughter of the late Mr. Williams. “As Hosea Feed the Hungry, we realized we were not meeting the needs as much as we could. We are determined to meet as many needs of our community as possible,” Omilami told Atlanta Progressive News. “Whether it be scattered site housing for the working poor, reading programs in the schools, baby products, rent and utility assistance, we are here to meet more substantive kind of needs and sustain our community in a different way,” she said. Hosea Williams is best known as the 1971 founder of Hosea Feed the Hungry, but Williams was much more. He was also a research chemist, a minister, civil rights leader and a philanthropist. His organization, HFTH, is best known for feeding thousands of hungry people on holidays. But like its founder, HFTH, is much, much more. Since its founding in 1971, HFTH has donated billions of dollars of food, clothing, medical, and educational supplies to recipients in Georgia, Uganda, the Philippines, and the Ivory Coast. Now the nonprofit is expanding to includes youth outreach, reading programs, and school supplies for children; and expand its homeless housing project. Mrs. Omilami presented the media with some statistics on what Hosea Helps is doing. “We help over 75 families per week with emergency food, over 22,000 hot meals to senior citizens during the year, plus we feed 51,000 people a year,” Omilami said. Through HH’s scattered site housing program, they help one hundred and twenty families a year with housing. “We pay the first six months of their rent and help them get a job,” Omilami said. 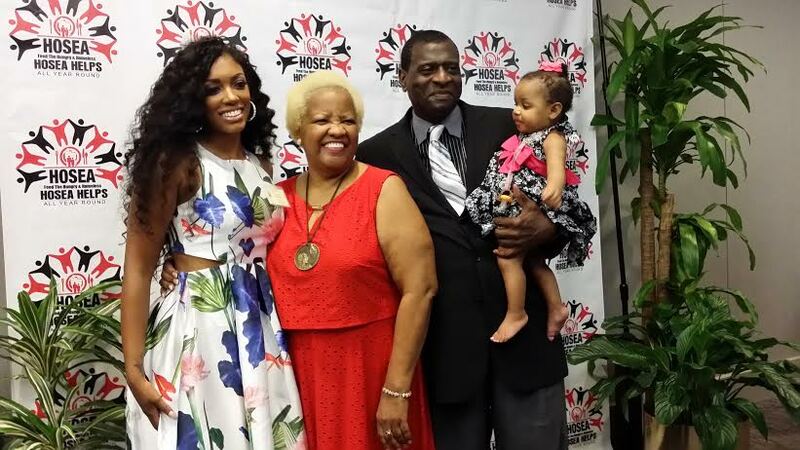 Porsha Williams, an actress, model, and singer, donated five thousand dollars to her grandfather’s organization, Hosea Helps. Aetna sponsored the day’s events. A documentary was shown where HFTH was awarded Aetna’s 2013 grand prize of 30,000 dollars for winning the National Voices of Health Campaign. The campaign was created to honor organizations working to close racial and ethnic health care inequality gaps and improve people’s health. The money helped to support the many services that HFTH provides. “We thank God and our donors for supporting us in this new expansion,” Omilami said. We are giving a geographic area so readers will be able to know where these services are being provided. Hosea Feed the Hungry works out of the Donnelly Street area about 2 miles from the West End Bus Rail Station across from the West End mall. They have a track record and represent many people who are fighting unfair labor lawws, competition from other countries labor pools and stagnant wages from large corporations that can afford more but don not. Hosea fought in WW2 in the German theater and also was fairly elected to the notorious Atlanta City Council which meets on Trinity St. and Washington 1 block southwest of the the Georgia state capitol.